Chhata Pokhar Tank with chhatri, Dulmi, Manbhum District. bl.uk > Online Gallery Home	> Online exhibitions	> Asia, Pacific and Africa Collections	> Chhata Pokhar Tank with chhatri, Dulmi, Manbhum District. 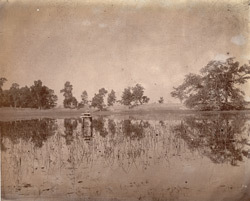 Photograph of the Chhata Pokhar Tank with chhatri, Dulmi, Manbhum District taken by J.D.Beglar between 1872 and 1873. At Dulmi, the only standing structures are a small Sivaite temple and the remains of a fort. There are numerous mounds dotted around the town, few of which have been excavated. "The largest tank in the place is known as the Chhata Pokhar, and is so named from a chhata or chhatri in the tank. The chhatri is built of stone, in what was once perhaps the middle of the tank; the superstructure consists of a couple of stout pillars, supporting a round slab, ornamented in the usual way, and surmounted by smaller ones in the usual way. The chhatri is traditionally said to be the spot where Vikramaditya used to perform puja before going to bathe." J.D. Beglar, (A.S.I. vol. VIII, Calcutta, 1878), pp. 187-88.